It’s hard to find furniture that doesn’t overcrowd your space and will actually give you storage room when you have a small bathroom. 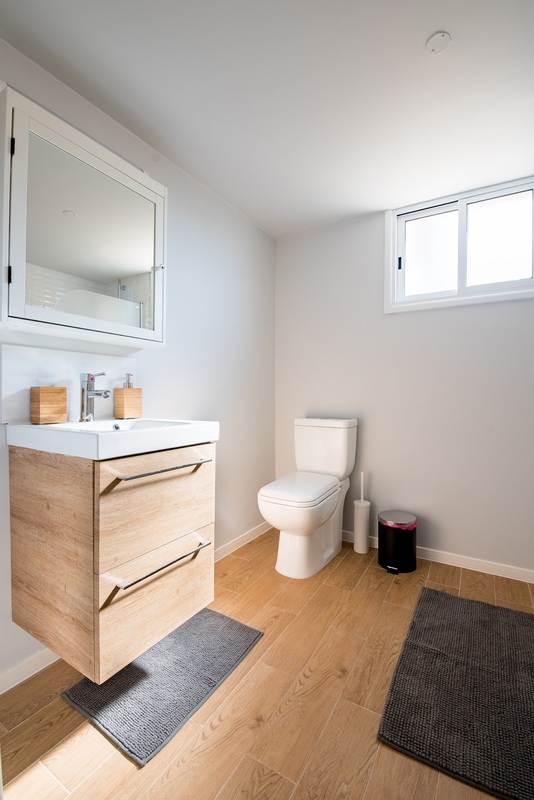 Luckily, your small or half bathroom doesn’t have to feel squished and cramped to get more storage out of it. Designers, like Inolav, have been creating sleek and elegant bathroom vanities and cabinets that fit seamlessly in tight spaces. If you aren’t totally in love with your bathroom, it’s time to refresh the design with one of these six vanities guaranteed to enhance bathroom efficiency and make any half bath feel bigger. If you’re looking to transform your bathroom into a luxurious, modern day spa, then the Adams Collection by Inolav is just what you need to enhance your space. Available in 25 inches, these small floating vanities fit in narrow bathrooms without feeling too bulky. Their wall mount design frees up floor space and will actually make your bathroom feel larger. Plus, you could technically use that space for a storage basket— though you probably won’t need to with the built-in storage cabinets on these vanities. Its minimalist design conceals under the sink storage and behind two sleek, soft close cabinet doors. There’s a hidden drawer behind the doors that’s perfect for toiletries, towels, or linens. Looking for that ‘wow’ factor? Try the infinity sink or quartz counter top to give your bathroom a five-star spa feel. Select from espresso, metal grey, or matte white to best match your personal style and other bathroom décor. If you want something the slightest bit smaller with a different contemporary feel, then this vanity from the Elton Collection is exactly what you’re looking for. It’s only a snug 24 inches, making it a great addition to any small half bathroom. Its design is very elegant with a porcelain single sink and subtle soft close drawers that will help modernize any room. The Elton vanity combines sophistication with contemporary design to give you an almost futuristic feel. Select from dark walnut, espresso, metal grey, or matte white finish for your vanity drawers. If you’re not into floating vanities, and you want a little more storage space, then you’ll want to check out the Emmet Collection. It has the same storage space as Inolav’s floating vanities, but with an extra shelf at the bottom for towels or a short basket for toiletries. In fact, this collection has the same beautiful bathroom vanity design as the Adam Collection, but with legs and an extra shelf. It’s only 25 inches wide, and is also available in espresso, metal grey, and matt white. However, you can’t get an infinity sink in this style, but you can get a porcelain or quartz counter top for that extra-lux feel. If you’re looking for something a little more classic with a modern feel, consider the Parsons or the Fulton Collection – particularly the Fulton with a classy vessel sink. There’s just something special about the look of a vessel sink that is timeless and refined. Not only is the sink porcelain, but the counter top is quartz stone as well. At only 24 inches wide, this small vanity has frosted glass panels on each cabinet that give it more of a tranquil feel – perfect for any modern, zen-inspired bathroom designs. Plus, you don’t worry about compromising on storage space with this vanity piece. There’s ample space under the sink with the vessel design, and a spacious drawer underneath the cabinets. If you still haven’t fallen for one of these designs, the simplicity of the Parsons Collection might be just what you’re looking for. This understated look is ageless with straight lines and right angles to create beautiful symmetry. It has two tall shelves inside for storage and offers a porcelain or quartz counter top. The final vanity that will help make your half bathroom feel bigger is from the Watson Collection. This 25 inch vanity combines classic charm with a luxurious, modern feel. Similarly to the Parsons vanity, all the storage space is tucked away behind soft closing doors and drawer for a less cluttered space. You can choose between white, beige, or gray quartz for the counter top, or calacatta quartz for more of a marbled look. These six bathroom vanities are the prefect storage solution for any small bathroom. They fit comfortably into tight spaces and can transform any bathroom into a modern spa. Complement your aesthetic with any of these six vanities by customizing it and choose the perfect cabinet finish, counter top, sink, and option back splash piece to complete your bathroom makeover!